Hello my friends! 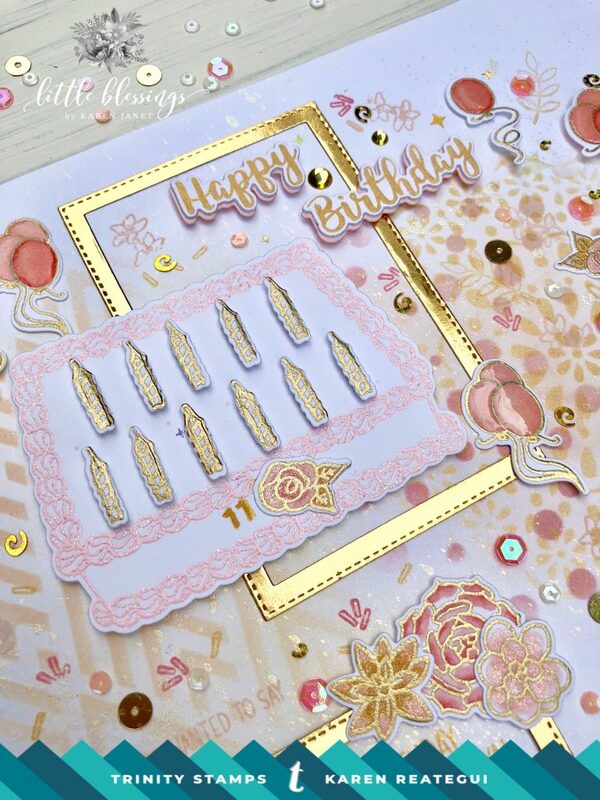 Today I’m really excited to share with you my first oficial blog post for Trinity Stamps. For this occasion, I decided to make a scrapbook layout with a celebration theme because today’s a day to celebrate! 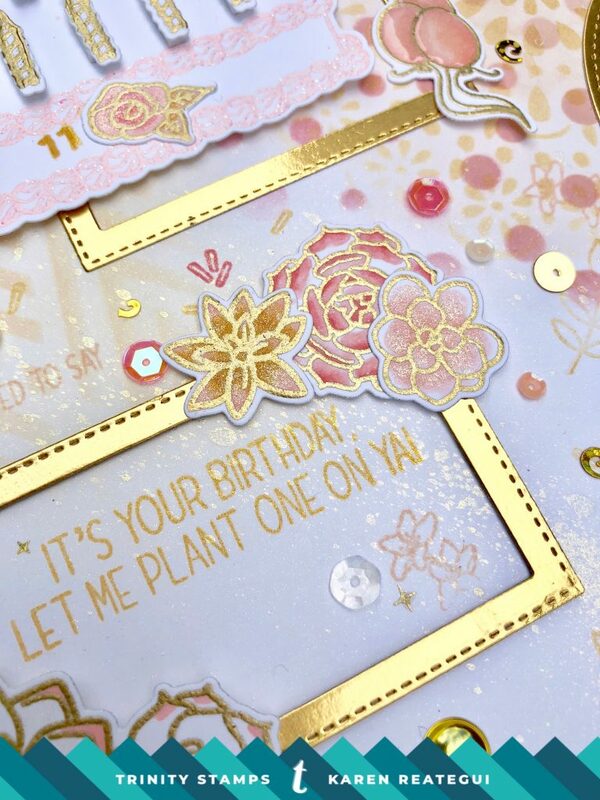 In this project, I’m featuring the Decorate-a-cake and Let Love Grow Stamp sets. Both are amazing stamps with gorgeous images! I love so much the cake! This project was inspired and dedicated to my sweet and beautiful little sister Antonella, who is turning 11 today. Happy Birthday beauty! Let’s start! I positioned three different stencils on top of an A4 Neenah Classic Crest Solar White cardstock and added some Delicata Golden Glitz ink from Tsukineko, Tatered Rose and Picked Raspberry Distress Oxide inks using a Mini Ink Blending tool. Then, I sprayed gold shimmering on top. My next step was to cut one oval and two rectangle frames out of gold cardstock and placed them on top of my panel using tape runner. After this, I stamped all my images and colored them using Copic Sketch markers. I used the following colors R00, R01, R20, R22 and RY23. When I was finished coloring, I run through my die cutting machine all the images with the matching dies. Next, I placed the cake, the succulent, flowers and the photo decorating each frame and using foam tape for more dimension. Also, I added the candles, balloons and the stacked Happy Birthday sentiment. I continued, stamping in the background small images from the stamps sets. Finally, I added Ranger Glossy Accent to the balloons and diamonds from the succulent and some sequins for a shiny look. In this project I tried to create a dramatic background with lots of shimmer. The photo can’t tell how beautiful the gold embossing powder and gold colors really look like. However, I was able to combine two different stamps and I’m very happy with the layout. I was totally satisfied with the final result. This was my first attempt for scrapbooking so I really hope you enjoyed it. 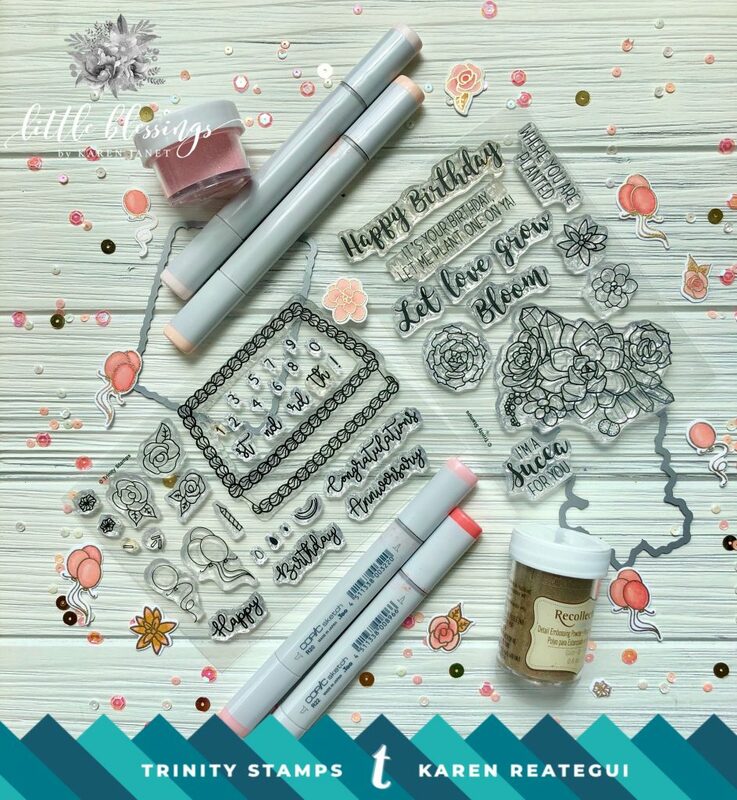 Don’t forget to head over Trinity Stamps website to grab some awesome goodies. Have a fantastic day!